We have thousands of properties for sale all over France. But we've no property for sale in Montreuil-sur-Mer at the moment. And that's something we want to change. If you have a property to sell in Montreuil-sur-Mer (or nearby) then act now to get a 50% discount. Just place your advert in the normal way (Click here to place your advert). 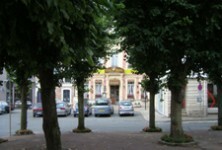 Then send us an email quoting "Montreuil-sur-Mer" and telling us that you you saw this offer. The hilltop town of Montreuil-sur-Mer, which lies in northern France on the River Canche, retains the "on sea" part of its name even though this is no longer strictly true. Once upon a time, the estuary of the River Canche reached the town, and it was a busy and thriving port for trade ships. By the 18th century, however, the river had become so silted up that poor Montreuil was no longer "sur mer", but actually left lying some distance inland. The town, however, is still a very attractive and interesting place. Mediaeval in origin, the ramparts are still visible and there are a wealth of fascinating and quaint old streets and buildings to enjoy. Montreuil-sur-Mer stands atop its chalky podium and seems to gaze towards the sea... as if wondering, perhaps, where it has gone! The town, once a wealthy port, later became an important strategic military point, as France's northern barrier against Spain (who at that time owned Belgian territory). Even later it became famous as the setting for Victor Hugo's tale of injustice against the poor, "Les Misérables". In all these incarnations, however, Montreuil-sur-Mer has remained a town of infinite fascination and of considerable beauty. Today, the River Canche provides not trade but tourist and leisure facilities and generates an economy from this. The fortifications are now promenaded by visitors and those hoping to gain a sense of the town's history, rather than by soldiers, and the ancient cobbled streets ring to the sound of holiday makers' cheerful voices. The people of Montreuil-sur-Mer take great pride in their town, and they are known for the beautiful floral displays with which they decorate their streets and buildings every year. Montreuil-sur-Mer has won a prestigious national award for these displays, and they are certainly a colourful and attractive addition to the town. When in Montreuil-sur-Mer you should take a little time to appreciate its historic and architectural heritage. Take a look at the Gothic churches, walk the ramparts and see the distinctive round towers on the southern face of the ancient fortifications, or the restored Boulogne gateway on the north side. The picturesque streets, often cobbled and twisting, are beloved of artists who can be found in the quiet corners of Montreuil-sur-Mer, setting up their easels and attempting to capture the "je ne sais quoi" of this lovely town. Montreuil-sur-Mer has a little of just about everything you are likely to need for a comfortable life. There are plenty of shops, a typical Saturday market, with all the colour and bustle that that brings, an antiques shop, banks, a supermarket and numerous bistros, cafés and excellent restaurants. At certain times of the year too, there are a number of fêtes or local celebrations, possibly the best of which is the outdoor theatre presentation of "Les Misérables" in the Vauban designed citadel. It is also possible to take a "Les Misérables" literary tour of the town, and walk in the footsteps of Jean Valjean and Cosette! For the sporty, Montreuil-sur-Mer can offer a round of golf, perhaps, at nearby Le Touquet, or horse-riding in the lovely countryside of the Pas de Calais. Take a boat trip on the river, or have some lessons and learn to kayak and canoe. Swimming, tennis and other sports are easily accessed in or near to Montreuil-sur-Mer, and the name of the town may remind you that a trip to the seaside will not involve travelling any great distance! The best way to reach Montreuil-sur-Mer from the UK is probably to take a ferry to Calais, or one of the other northern ferry ports, such as Boulogne and Dieppe. Most of the northern ferry ports are within reasonable reach. Lille is also close to Montreuil-sur-Mer, meaning that train travel is possible too as Eurostar can take you there direct from St Pancras. Property prices in the area are stable, but not too expensive. This is set to change, however, as there has been considerable ongoing investment in the region, and it is steadily becoming more and more desirable an area for property seekers. Property in Montreuil-sur-Mer could prove to be a shrewd investment. Do you know Montreuil-sur-Mer better than we do? Do you have photos of Montreuil-sur-Mer? Montreuil-sur-Mer is located in the far north of France, in the west of the Pas-de-Calais department. The town lies on the River Canche. Access: By air: The airports of Le Touquet and Paris Beauvais are not far from the town, but the nearest major airport with a good choice of flights is Paris. By boat: The town is well served by ferry ports, the nearest being Calais, Boulogne and Dieppe. Economy: Once a major port, the town's economy is now diversified. 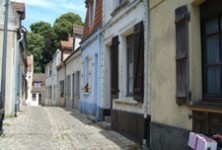 Interesting fact: Montreuil-sur-Mer is the setting for Victor Hugo's novel "Les Misérables".